But at the same time, his administration is quietly pushing for millions more to allow the federal government to speed up approvals for the sale and transfer of actual machine guns. It’s billed as part of the Trump administration strategy to reduce violent crime - although officials can’t say how - and it’s tucked into the Justice Department’s FY2019 budget request. “Our country has seen three dozen mass shootings since 20 children and 6 educators were murdered at Sandy Hook…Rather than focusing on a top gun lobby demand the administration should put money toward ATF to hire additional agents and improve the background check system,” Feinstein said. The National Firearms Act, passed in 1934, effectively made it a crime to possess, purchase or sell an unregistered machine gun. It was meant to address a significant crime problem of that era: the frequent use of machine guns by gangsters in high-profile killings like the St. Valentine’s Day Massacre. New machine guns were effectively banned for the civilian U.S. market when the Firearms Owners’ Protection Act was signed into law by President Ronald Reagan in 1986. No machine guns produced after May 19, 1986, could be sold or possessed. With the right Bureau of Alcohol, Tobacco, Firearms and Explosives (ATF) paperwork and tax payments, machine guns made before that date can still be purchased on the private market, but because of the 1986 ban, prices have skyrocketed due to demand outpacing the limited supply. Gun experts say a machine gun can cost anywhere from several thousand to several hundred thousand dollars. The money the Trump DOJ wants to spend, $13.2 million, would go to “address workload” and reduce the backlog of applications under the federal National Firearms Act. It’s aimed at reducing the time it takes the ATF to approve the transfer and sale of devices regulated under the act, including machine guns, silencers, short-barreled shotguns, short-barreled rifles and other “destructive devices,” including bombs. “ATF is overwhelmed with NFA paperwork,” according to Lawrence Keane, senior vice president of the National Shooting Sports Foundation (NSSF), the leading gun industry trade group. “It has been a significant problem. It takes eight to nine months to process a single form,” Keane told ABC News. 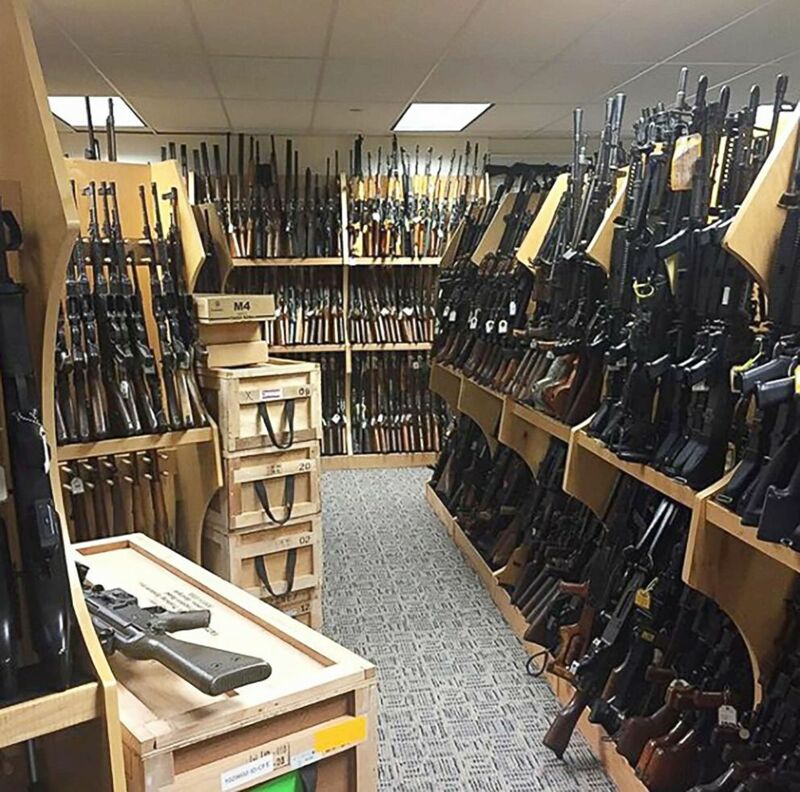 This undated photo shows the ATF Reference Library, a working collection of more than 15,000 firearms. Gun industry experts say the bulk of applications under the act are for silencers and so-called “shorty” guns, rifles and shotguns with barrels less than 16 or 18 inches respectively. The latest 2017 ATF data shows there are more than 630,000 machine guns registered with the ATF and more than 1.36 million silencers registered. Last year, according to ATF, more than 5.2 million weapons were registered under the NFA. Silencers have become a popular accessory for gun enthusiasts and silencer manufacturers have pressed to have the devices, which have the effect of muffling the sound of gunfire, to be deregulated in the Hearing Protection Act of 2017. That measure was introduced last year in the House of Representatives but was tabled after the Las Vegas massacre last October that killed 58 people. The number of silencers registered with the ATF has exploded in recent years, more than tripling since 2011, going from 360,000 registered silencers in 2011 to more than 1,360,000 in 2017. The number of silencers jumped 50 percent from 2016 and 2017, according to ATF data reviewed by ABC News. The president’s son, Donald Trump, Jr., has been a big supporter of the Hearing Protection Act and recorded a video touting the benefits of the accessory with Joshua Waldron, CEO of top silencer manufacturer SilencerCo. Silencers are now legal in 40 states. Keane says NSSF supports additional funding for ATF’s law enforcement mission, but that they have an industry mission that needs to be supported as well. He says ATF is chronically understaffed. But current and former ATF officials who spoke to ABC News on the condition of anonymity say reducing the backlog of applications for NFA restricted weapons has little to do with violent crime. “It would have minimal to no effect on combatting violent crime,” one former ATF official said. “It appears to be a compromise for the gun lobby,” the former official added. Under the NFA, a machine gun is defined as, “any weapon which shoots, is designed to shoot, or can be readily restored to shoot, automatically more than one shot, without manual reloading, by a single function of the trigger.” That means if more than one bullet is fired from a single trigger pull, it’s a machine gun. This the reason why, current and former ATF officials say, bump stocks are difficult to regulate – the law defines a machine gun in plain language they say permits bump stocks. A bump stock slides back and forth on a rifle making it easier for the user to pull the trigger in rapid succession, with one bullet being fired with each trigger pull. Justice Department officials could not say exactly how reducing the NFA backlog would reduce violent crime. They would only say that some prohibited purchasers could be rejected in the application process. Those rejections would still happen in the existing system, but they would occur more slowly. Either way, a prohibited purchaser would not be allowed to buy an NFA regulated weapon. The NFA approval process is distinguished from standard firearms background check in that the weapon is registered with the federal government. The application process also requires the submission of fingerprints a photograph and notification to local law enforcement official that an application for an NFA weapon is being made. Under the Trump administrations budget request for reducing violent crime, the $13.2 million to fix the NFA backlog is far more than the $8.9 million requested for increasing gun intelligence capabilities to solve violent crimes. Current and former ATF agents say the money would be better spent on hiring and training new agents that could enforce existing gun laws.